The Europe market is getting ready to receive three new LTE Samsung devices (all Android powered), as the Galaxy S3, Galaxy Note 2 and Note 10.1 release dates for Germany has just been leaked. So, even though these are only rumors, the mentioned devices are ready to debut in several Europe countries, with Germany in top of the list. We actual have the exact dates on when the handsets will be launched so for further info check the lines and leaked documents from below. According to our sources, the LTE SGS3 release date in Germany will be next month (week 40), so you should start saving money as the pre orders might start soon. The phone will apparently be available in Titanium Grey color and of course will be offering improved speeds and web browsing experience due to the LTE capabilities. We all know almost everything about the S3, from specs, features and design, so there isn’t much to say about the same. The leaked document is below, so take a look. Now, as you can see on the following images, the Samsung Galaxy Note 2 release date should be only two weeks later after the S3 one (week 42) and the LTE SG Note 2 event should be in November (week 46). Also, the Note 10.1 should be made available in Germany on the same date with the Note 2, as the leaked document is giving clues about the same October date. 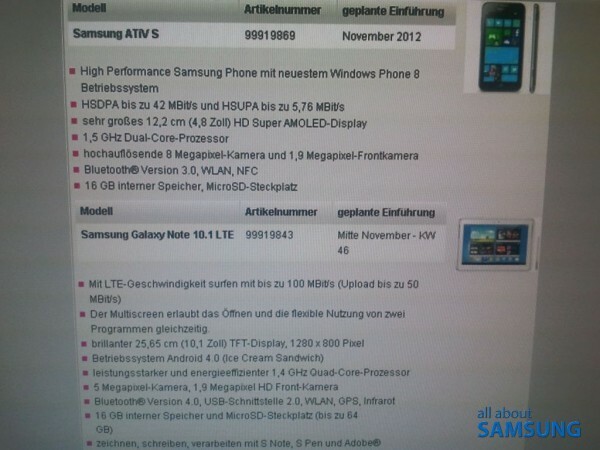 Furthermore, the Windows 8 powered Samsung ATIV S handset is present with an probable November launch date. So, there is more LTE than the German users and customers might expect, not to mention that all the devices are highly-expected ones. Samsung is really trying to impress the audience lately, though the rest of the European countries are still waiting for an announcement to come. Anyway, that was all for now, but stay close as we are expecting fresh news to be announced in the coming days.